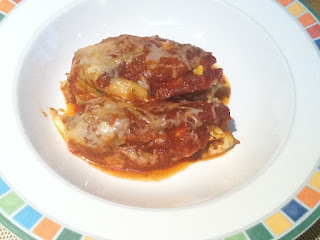 I came up with this recipe the other night when I was trying to think of a healthier version of eggplant rollatini. I decided to stuff the eggplant with acorn squash to lessen the amount of cheese usually used. The result is a delicious and nutritious meal the whole family will enjoy. I know mine did! It's loaded with vitamins A, C, D and K, calcium, fiber, folate, potassium and iron. This can be pureed for little ones 9+ months or served as finger food for older little ones. Preheat oven to 375F. Cut acorn squash in half and scoop out seeds. Spray with olive oil cooking spray and place on a baking sheet and cook for 35 minutes. When squash is cooked scoop it out and fork mash in a large mixing bowl. Add ricotta cheese, chopped mushrooms, chopped spinach, mozzarella cheese, parmesan cheese, nutmeg, Italian seasoning and egg. Stir until smooth and set aside. Spray two large baking sheets with olive oil. Peel and slice eggplant and place spread out on baking sheets. Spray eggplant with cooking spray and season with a little salt and pepper. Set oven to 350 and place eggplant in oven and bake for 10-12 minutes. When eggplant is cooked, spoon acorn squash filling (about 2 tblsp) onto eggplant and roll up. Place eggplant roll ups in a deep baking dish and cover them with marinara sauce. Sprinkle with shredded mozzarella and a little grated parmesan cheese and place in oven. Bake for 30 minutes. Serve and enjoy! Serving size for your little one is 1 roll. You can serve this with some pasta if you like.